Welcome to the Early Education Center web pages! 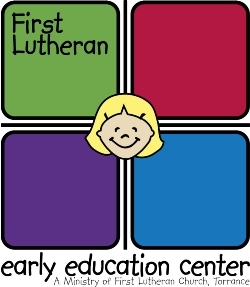 With two locations in the South Bay, First LutheranEarly Education Center provides families with an excellent morning preschool program as well as full day child care for children age 6 weeks to 5 years. Our main center, located on the campus of First Lutheran Church and School, offers 7 classes for children, ranging in age from 6 weeks to 5 years old. Our satellite center is located on the campus of St. Mark's Presbyterian Church, serving children age 6 weeks through 5 years old. Both centers are open between 7:00am and 6:00pm, Monday through Friday. Our Infant/Toddler program offers a safe, loving environment in which your little one can thrive. Our Preschool classes provide a nurturing and creative environment for three, four and five year olds, where they can explore, discover, and blossom. Low teacher/child ratios and experienced and educated teachers make First Lutheran Early Education Center a wonderful place for children to grow. Our programs have been recognized as truly excellent settings for education, caring and growth for kids! The EEC is a member of the Evangelical Lutheran Education Association, and our Director, Mrs. Shirley Becker, has received the Director of the Year Award by the Evangelical Lutheran Church in America. In the spring of 2013, the center completed an in-depth self-study, and was certified as an ELCA Center of Wellness through the ELEA. We strive to provide a place of wellness for the children and parents we serve, as well as the employees on our staff in the following areas - Emotional, Social, Physical, Financial, Spiritual, Vocational, and Intellectual. "You are simply the best! I have toured many daycare/preschool centers and chose FLEEC because of the care and development that they provide to my child. Your newsletters are fantastic and give me great ideas, and the special events like mud day, yearbooks, etc are also very welcome. Thank you so much for the wonderful job you are doing to help raise my child into an independent and caring child."